Osteoporosis or, in other words, bone density loss occurs more often in women than men due to their increased risk of bone thinning due to the menopausal hormonal changes. Post menopausal osteoporosis is more prevalent in the larger group of women than premenopausal osteoporosis that is usually seen in women who have undergone steroid treatments or who have a family history of osteoporosis. Post menopausal osteoporosis greatly affects a woman’s quality of life who have to make lifestyle changes in the attempt to avoid injuries that might result in wrist, hip and leg fractures. Some women stop going outside altogether trying to avoid dangerous situations which puts women at even higher risk of developing vitamin D deficiency due to the inadequate exposure to the sun light. 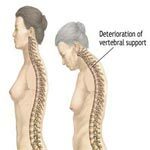 Most common symptoms of post menopausal osteoporosis include pains in the neck and back, bone tenderness and sensitivity, one or more actual bone fractures within a short period of time, loss of height inches due to the shrinking bones. The post menopausal osteoporosis is diagnosed with the help of DEXA scan that assesses the thickness of ones bones. Once you have been diagnosed with a post menopausal osteoporosis your doctor will help you choose from a myriad of bisphosphonate therapy options. Bisphosphonates are medications working by blocking off a group of bone cells responsible for the break up of bone tissue and make bones much denser preventing bone calcium absorption by the body. Reclast infusion therapy is offered through a series of intravenous injections that work in a very similar way as bisphosphonate therapy. Along with the doctor prescribed post menopausal osteoporosis treatments, calcium, magnesium and potassium supplements were advised to be a very effective way of increasing bone density. Understanding all the post menopausal osteoporosis symptoms and potential treatment options will be helpful for you to make the right choice with the help of your health advisor.